Your Sample Size Calculator is Snap Sampling Plans! You can use this sample size calculator to tell you how many items to select when you are conducting inspection activities. Snap Sampling Plans!, based on statistical industrial standards, helps you determine sample size. To understand sample size determination, you need to know a couple of items which include the following. The criticality of the feature. Snap Sampling Plans! provides the exact calculations based on a few easy questions. You do not need to be an expert to use this software; it was design for the beginner. Single Piece: This is for continuous production. The machine handles one piece at a time. After the machine adds a feature to the part, then the machine works on the next part. This is also true for an operator conducting the work. Inspection occurs immediately after production. Parts move to the next production area in a singular matter. Lots: The machine or operator handles multiple items within a short amount of time. The machine can take several parts and add feature(s) to those parts at a given time. The machine may be so fast that shutting down the machine to conduct single piece inspection is not worth while. Instead you wait until parts accumulate and then conduct inspection by selecting a random sample. The lot comes from one period of time from the same or similar machines. The lot is homogenous. The parts move together in a lot to the next production area. Lot / Single Piece mix: This is a combination of lot / single piece. Parts move to the next production area in small quantities of 2 to 10 parts. When this occurs you can choose to conduct single piece or lot inspection. For lot inspection, you may want to combine runs into a larger lot. Short Run Production: This occurs when there is infrequent production on a given machine. The machine works one type of part for a short amount of time, usually less then one day. The machine then sits idle or works on an entirely different type of part. Once production completes, you move the entire production to the next station. AQL: Acceptable Quality Level. The limit of satisfactory process average. Represents the poorest level of quality for the vendor's process that the consumer would consider acceptable as a process average. AOQL: Average Outgoing Quality Limit. The worst possible average quality that would result from following the inspection plan including rectifying inspection. If the parts failed the inspection plan, then this includes 100% screening of the parts. LTPD: Lot Tolerance Percent Defective. The poorest level of quality that the consumer is willing to accept in an individual lot. Minor: The inspection feature is of minor importance to the actual function of the part. But still important enough to be inspected. For example, consider a scratch in a painting job to be a minor feature. Typically these are cosmetic issues. Major: The inspection feature, if not within specification, causes (or could cause) product failure. This could be the inspection part itself or a product that depends on that part. For example, if the length of pants is out of specification then the consumer will not be able to wear it. Critical: The inspection feature causes (or could cause) a safety related issue. If a failure of this feature triggers harm to an individual, that feature is consider critical. For example, if a car’s brakes give out then all components of those brakes are consider critical. A sample size calculator needs to be based a several different industry and military standards. These standards include Mil Std 105, Ansi Z1.4, Schilling Zero acceptance, Squeglia Zero Acceptance , Dodge Romig and Mil Std 1235. Each standard approaches the sample size determination based on different key criteria. Snap Sampling Plans! helps you select the correct standard and then calculates the sample size based on lot size and AQL. Non Destructive: The inspection leaves the part in tact. The part can be used "as is" after the inspection. The part can be shipped to your customer. Destructive: The inspection damages the part. The part cannot be shipped or used after inspection. Some industry plans include the cost of inspection as a determining factor. If the inspection cost are very expensive then there is some allowed reduction of the inspection. If your customer specifies a given sampling standard and AQL, and the inspection cost are high, then discuss lowering the level of inspection with your customer per the sampling plan standard. A sample size calculator should show you other possibilities for high cost of inspection issues. Receiving Inspection: This inspection occurs when parts arrived at your dock. You determine the inspection characteristics. Normally, you inspect major and critical level features. Follow the industry standards that use "lot" inspection for receiving inspection. Inprocess Inspection: This occurs during production of the parts. You inspect the part after a machine operation or when a feature is added to the part. Here you determine if the part meet specification and the machine is performing correctly. This may be a combination of "continuous" production inspection and SPC. Depending on your production, you may follow a lot inspection or a continuous inspection standard. Final Inspection: This occurs after the last production stage. It may occur prior or after packaging of the product. Some companies conduct final prior to packaging and then conduct another inspection after packaging. Final inspection may focus on a combination of minor, major and critical features. Each of these features could have a different sampling plan. 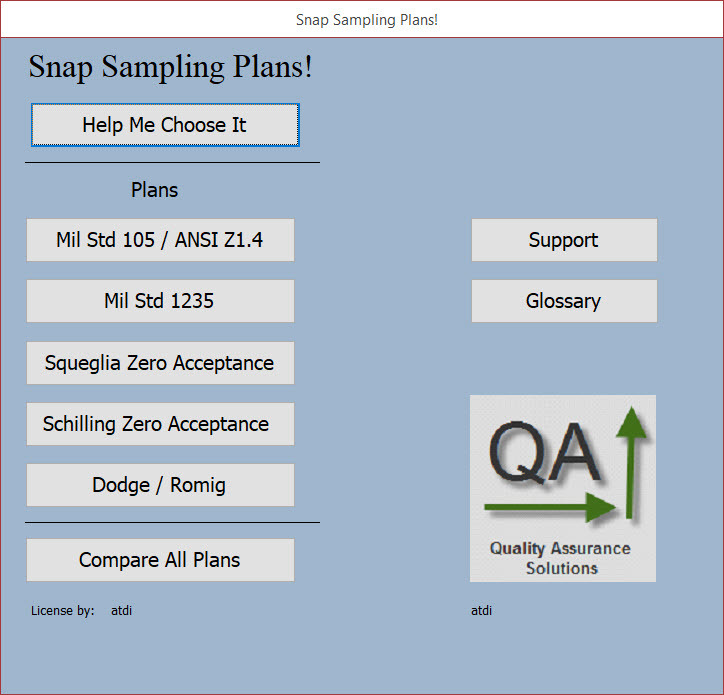 For all of the above locations, a sample size calculator such as Snap Sampling Plans! can quickly determine the sample size. If you track the defect history for a given inspection feature and make manufacturing improvements, then with these improvements,you can reduce the sample size. To calculate sample size, you enter the lot size, AQL, and defect history into the sample size calculator. This page describes more on attribute plans.